The Suna Besha of Lord Jagannath happens the day after the return of the Lords from Gundicha Temple or Mausi Maa Mandir. On the day of Bada Ekadasi, the 11th day of the bright fortnight in Asadha, the deities, on their chariots took the golden attire or the suna besa, with hands, arms and crown made of solid gold in front of Singhaswara. They are decorated with gold diadems, hands and feet made of gold. Lord Jagannath holds a gold Chakra (Disc) in his right hand and Silver Sankha (Conch) in his left hand. 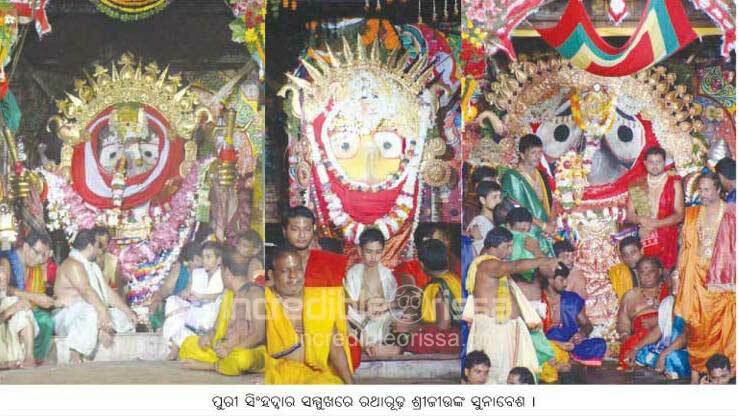 Lord Balabhadra holds a gold langala (plough) in his left hand and a golden Gada (mace) in his right hand. The dress reportedly weighs one ton. They are also offered sweet drinks, adhara pana on huge cylindrical earthen pots reaching up to their lips. They are taken down from the chariots in a ritual descent to enter the temple.